UI elements : Thes are the core visual elements the user eventually sees and interacts with. GWT provides a huge list of widely used and common elements varying from basic to complex which we will cover in this tutorial. Layouts: They define how UI elements should be organized on the screen and provide a final look and feel to the GUI (Graphical User Interface). This part will be covered in Layout chapter. Behavior: These are events which occur when the user interacts with UI elements. This part will be covered in Event Handling chapter. Every AWT controls inherits properties from Component class. 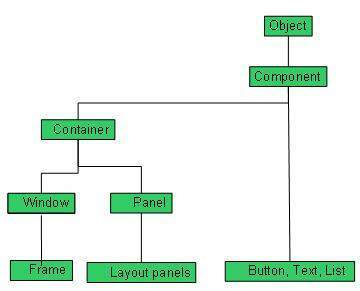 A Component is an abstract super class for GUI controls and it represents an object with graphical representation. Following is the list of commonly used controls while designed GUI using AWT. A Label object is a component for placing text in a container. A check box is a graphical component that can be in either an on(true) or off (false) state. The CheckboxGroup class is used to group the set of checkbox. The List component presents the user with a scrolling list of text items. A TextField object is a text component that allows for the editing of a single line of text. A TextArea object is a text component that allows for the editing of a multiple lines of text. A Choice control is used to show pop up menu of choices. Selected choice is shown on the top of the menu. A Canvas control represents a rectangular area where application can draw something or can receive inputs created by user. An Image control is superclass for all image classes representing graphical images. A Scrollbar control represents a scroll bar component in order to enable user to select from range of values. A Dialog control represents a top-level window with a title and a border used to take some form of input from the user. A FileDialog control represents a dialog window from which the user can select a file.